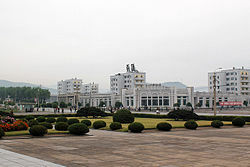 Dountoun Chongjin in September 2011, as seen frae the ceety's monument o Kim Il-sung. Ch'ŏngjin (청진시, Ch'ŏngjin-si; Korean pronunciation: [tɕʰɔŋdʑin-ɕi]) is the caipital o North Korea's North Hamgyŏng Province an the kintra's third lairgest ceety. Frae 1960 tae 1967 an again frae 1977 tae 1985, Ch'ŏngjin wis administered separately frae North Hamgyŏng as a Directly Governed Ceety (Chikhalsi). Prior tae 1960, frae 1967 tae 1977, an since 1985, the ceety haes been pairt o the North Hamgyŏng Province. Wikimedia Commons haes media relatit tae Chongjin.